Has the Site of the Ape Canyon Bigfoot Attack Been Rediscovered? Home / Strange Phenomena / Mysteries / Has the Ape Canyon Cabin, Site of the Most Famous Bigfoot Attack in History, Been Rediscovered? Has the Ape Canyon Cabin, Site of the Most Famous Bigfoot Attack in History, Been Rediscovered? Has the site of one of cryptozoology’s most famous tales of Bigfoot-related violence finally been rediscovered? After years of expeditions, one paranormal investigation group thinks they’ve located the Ape Canyon Cabin, and they’ve provided evidence to back it up. In July of 1924, four prospectors on a Mount St. Helens gold claim told journalists that they had endured a night from hell when numerous boulder-tossing, hairy “Mountain Devils” descended upon their cabin. The attack resulted in a one-sided gun fight, and one man, Fred Beck, claims to have shot one of the creatures, watching it tumble some 400 feet into the canyon to its ultimate demise. The story spread like wildfire, and found itself the subject of newspaper articles, books, and several televised recreations of the incident. The tale has remained one of the most curious reports of Sasquatch-related violence, and its prominence has even earned the gorge an official name: Ape Canyon. While the story has remained an important piece of cryptozoological lore for almost a century, the evidence has not endured the same fate, with the site and its cabin presumably destroyed when Mt. St. Helens erupted in 1980. For years researchers have hunted the remains of the cabin but with little success.. until now. For the last five years, Marc Myrsell and his Washington-based Dark Waters Paranormal Investigation team have spent their warm months hunting down evidence of the Ape Canyon Cabin, and after a series of fortuitous clues, believe they’ve finally discovered its location. But don’t go asking for directions, because DWP ain’t giving them out, at least not yet. All surface evidence of the cabin is gone. A 1936 trail map told us that one could see the cabin from the trail. But that was only 12 years after the incident. In 1968, Fred Beck had heard that the cabin had burnt to the ground. 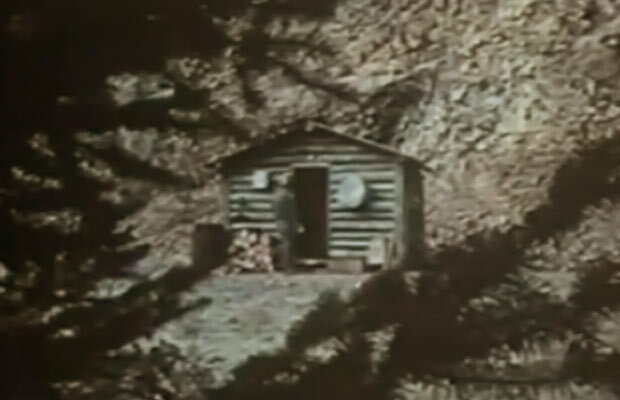 In 1972, hikers told Peter Byrne that they had visited the cabin. Today, it’s rock, steep slope and trees.. The nature of the site carries a high probability of very little human impact. The area has never been commercially logged as there are so few trees and these are very difficult to get out. The danger of traversing the area makes a high rate of human camp sites unlikely..
..the excitement began with the discovery of the wire, about 16″ long with a coiled loop at one end, like for a bailing or a handle, sticking vertically in the ground.. The excitement grew with a nail, a shank nail about 4 inches long.. jumping up and down and yelling and vigorous hand shaking ensued with the spoon. A single spoon. Just an old spoon. About 6″ underground.. But this was the clincher. We started finding more and more nails and finally got to a rotten horizontal log, again about 6″ underground WITH THE NAILS DRIVEN IN TO IT. As best we can tell, we probably found the long, 20 foot side of the cabin, guessing the uphill side. Myrsell goes on to say that there is plenty of work to be done yet, with more expeditions planned to continue excavating the area for better evidence, and even an Xray Dispersion Analysis to help date the spoon. These guys may very well have uncovered some real Bigfoot history. Now, if they could only find the body of the creature Fred Beck claims to have shot in 1924, people other than monster nerds like you and I might have even more reason to get excited. For more on the frightful Ape Canyon attacks, you can read the entirety of Fred Beck’s 1967 book I Fought the Apemen of Mount St. Helens, WA over at Bigfoot Encounters. More on Marc Myrsell and the Dark Waters Paranormal expedition, by checking out their Facebook page. So, just to make sure I’ve got it right; they didn’t find the actual cabin, but the remains of the cabin, right? That’s still pretty important – even if it’s not the actual, original Ape Canyon cabin, it’s still an important slice of Americana. I hope they document more of this stuff as time goes on. Yeah, the stories are all a little different depending on who told them. Fred Beck said that the cabin had burned down in the 60’s, but his partners had claimed to have visited it again in the 70’s. Of course, when Mt. St. Helens erupted in the 80s, it heavily affected the Ape Canyon region, so everyone already figured the cabin was long gong. These guys have been searching for the remains of the cabin for like five years, and it would definitely seem like they found the location. I’m really excited to see what they’re able to dig up next! Pingback: Has the site of the Ape Canyon Cabin been rediscovered? If the picture of the mountain is near the spot all one has to do is take the time go to google earth and match it to find the general location the picture was taking in… just saying..
Aaaah! If it were only that easy. This woulda been found so long ago!. This started about 5 years ago when I first started re-researching the Ape Canyon story and found that there was a much more complex story involved than the one reported on in the Beck interviews of the late 1960’s. Mind you, Beck’s recall, as an older man, was remarkably congruent with the original reports given by him and his father-in-law, Marion Smith in 1924, directly following the incident. However, as I got in to this story, I came, more and more, to realize that there may be some physical evidence left of the “attack” site that survived the eruption. So, about 2 years ago, I started looking, in EARNEST. There’s lots more to do, but I feel that the last field trip, early this month, found it. But it wasn’t easy. It was a multi-trip, a multi-year research project that involved putting the clues together on the ground that made it happen. I’ve been in contact with the archaeologist at the Gifford-Pinchot National Forest to discuss the project and to plan out a continuation of investigations in to the site. Hopefully, these effort will produce further evidence. It’s a remarkable story. I feel that it was on the verge of being canned in to the file of “tall-tale” and “legend”. Regardless of what “really” happened, I feel that physical evidence always makes it more “current” for the “current” generation and, hopefully, makes it more relevant. I have the book. It was given to me by Mr. Beck when I was very young. Very interesting. I remember reading the story of the attack many years ago. The aggressive behaviour is untypical of bigfoot but who knows how they might have been provoked by Beck and co. I doubt the remains of the bigfoot shot by Beck will be found as I feel its comrades would have found and removed the body. The old cabin itself could yield many interesting items though. Look forward to hearing more on this subject. Please keep me posted on all and anything Ape Canyon and Sasquatch/Bigfoot. In the original story Beck said he shot the creature in the back and he could see fur fly.That should have put him pretty close to the creature.He said it pitched over into the canyon below.They speculated that the flood waters had carried it away.